Erik Pevernagie: Camera obscura. 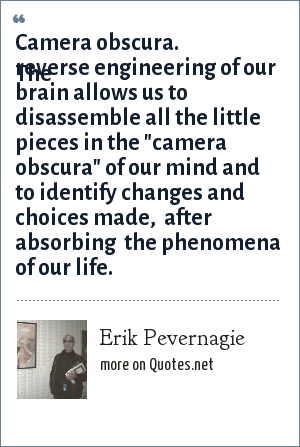 The reverse engineering of our brain allows us to disassemble all the little pieces in the "camera obscura" of our mind and to identify changes and choices made, after absorbing the phenomena of our life. "Erik Pevernagie Quotes." Quotes.net. STANDS4 LLC, 2019. Web. 18 Apr. 2019. <https://www.quotes.net/quote/63092>.